Today I’m going to show you something I built during the ETHWaterloo hackathon this weekend. ETHWaterloo is a hackathon themed around the cryptocurrency Ethereum, which is gaining a lot of traction lately. You have to build something using Ethereum technology, and you can listen to many talks given by experts in the cryptocurrency community. It was a great way to learn more about this new blockchain technology. The hackathon opened with a series of talks. I used to be good friends with Vitalik back in first year of university, but haven’t talked to him much after he dropped out of university to work on Ethereum. It was good to see him in person again at this hackathon. We often hear the media describe Bitcoin as “computers solving hard math problems to generate money”. Well, we made a new cryptocurrency, Eulercoin, where tokens are created by correctly submitting the answers to Project Euler problems! EulerCoin is implemented as a Ethereum smart contract that runs on the blockchain. A user submits answers to the smart contract, which then tries to submit it to Project Euler. If it’s correct, the user is awarded some EulerCoin. Correct answers are recorded on the blockchain forever so anyone can use it to cheat on Project Euler and access the solution forums. For each problem, only the first submitter gets awarded EulerCoin. The amount is larger if the problem has fewer solvers (meaning it’s a harder problem). I used to maintain a list of Project Euler answers since 2009, but recently it’s been hard to convince people to post their answers publicly. Something like EulerCoin would incentivize people to contribute their answers. Here’s a simple web UI, where clicking “Submit” opens up Metamask to initiate an Ethereum transaction. To avoid actually spamming Project Euler for a hackathon project, we mocked up the answer-checking component, but everything else works. This was the first time programming in Ethereum / Solidity for all of us, so it was a novel experience. After doing this hackathon, I have a much better understanding of what Ethereum does. Bitcoin is digital currency that can only be transferred and not much else. Ethereum is a whole platform where you can run your own custom, Turing-complete smart contracts, all on the blockchain. All Solidity code is run once by everybody in the blockchain. This is a big scalability problem — imagine that when you buy some coffee, everyone in the world from Canada to France to Vietnam has to process this fact! To sync an Ethereum node, you have to have downloaded a blockchain containing every Ethereum transaction from the beginning of time — too much data for my laptop to handle. This also means that storing even small amounts of data on the blockchain can get incredibly expensive. All data stored in the blockchain is visible to everybody. Because of this, it’s quite difficult to maintain any kind of privacy — this was a problem we ran into for one of our ideas. You can try encryption, but where to store the keys? If you put the keys on the blockchain, then anyone can see it, and you’re back to square one. There are some ideas of using fancy cryptography like ring signatures to keep privacy in limited situations, but these ideas aren’t quite mature yet. I’m curious to see how Ethereum will solve these big problems in the upcoming years. Our submission didn’t make the final round of judging, but we had a good time. Before the closing ceremony, our team gathered for a group photo. That’s it for now. I’m not sure if I want to invest my own money into Ethereum just yet, but certainly I will read more about cryptocurrencies. Bubble or not, the mathematical ideas and technologies are worth looking into. The idea is to share text message snippets in a more digestible manner. The usual way to distribute a chat log to a friend would to send them a transcript of the messages, along with timestamps and all. The information is there, but it’s mentally taxing to read through it, and it’s especially difficult to make sense of the timestamps. We figured it would be much easier to watch the conversation unfold in real time. This way, you see the conversation one message at a time, instead of all of it at once. In the future, this will be a widget that you can embed in a blog or website. The reader can toggle the playback speed and use the slider to jump anywhere in the conversation. We also built a set of utilities to import conversations from Facebook Messenger and Skype into a JSON format that our app can understand. Right now, these utilities are a bit clumsy to work with, so we’re holding back on releasing the project. 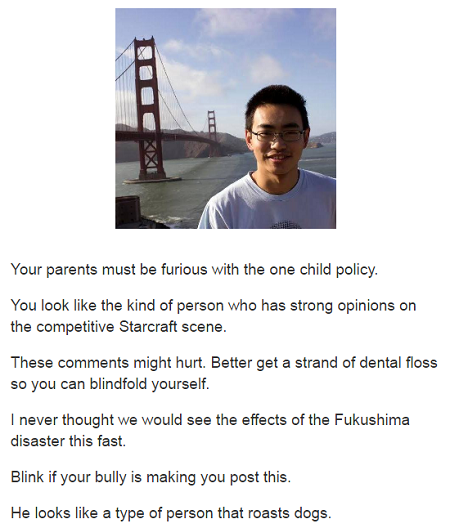 Roboroast: upload your photo to get an algorithmically generated insult! I’d like to share a side project I’ve been working on for the past few weeks. 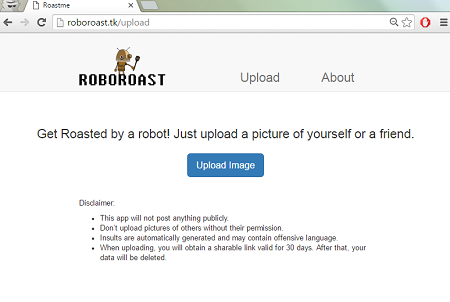 Roboroast is an app that automatically generates humorous insults for you or a friend based on how you look. It was written in collaboration with my friend Andrei Danciulescu. The basic operation is as follows. 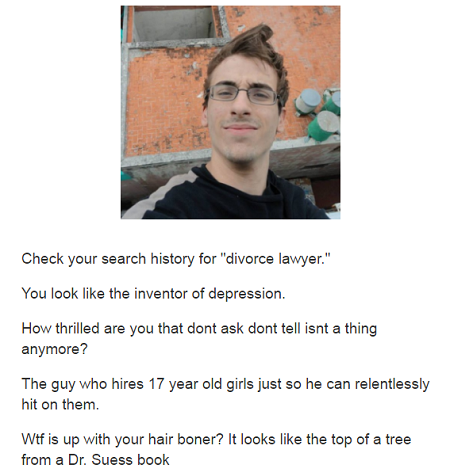 There’s a subreddit called /r/RoastMe where random people post a picture of themselves, and other people proceed to “roast” the person with funny comments making fun of his appearance. Our app takes your photo and uses a face recognition algorithm to find a poster in /r/RoastMe who looks like you. Then we display the comments for your closest matches. You can try it at roboroast.tk. Part 1 is the Reddit scraper. We use the PRAW API to go through all posts on the /r/RoastMe subreddit, saving comments to MongoDB and saving images to the filesystem. Part 2 is the Face++ uploader. Face++ is a cloud service with a REST API that handles our face matching. To use it, we upload all the images from part 1 into a “faceset” which we can query later. The first two components only need to be run periodically, maybe once a month to update the faceset with new posts from Reddit. Part 3 is the webapp, which is the use facing component. It accepts user uploads, searches for matches using the Face++ API, and renders a list of insults to the user. 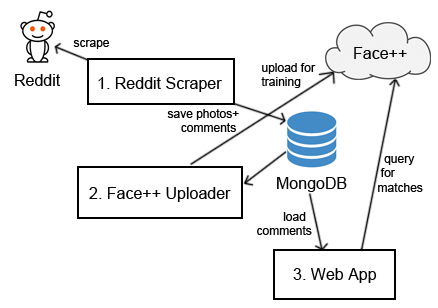 As mentioned before, we used a number of third party APIs; PRAW for scraping Reddit posts, and Face++ for face recognition. All the backend code is written in Python. The web app uses the Flask web framework, and is wrapped with NGINX and Gunicorn to handle connections and serve static files. We use MongoDB for the database. The whole thing is hosted on a single AWS EC2 instance. How good is the face matching? The face matching is actually decent. Face++ produces reasonable matches most of the time. To see the matching results for yourself, you can append ?r=1 to the end of the URL (on the results page). This is hidden by default. Do the insults make sense? Although the face matching does a decent job, we found that the quality of results were somewhat hit-or-miss. When we envisioned the concept for this app, we assumed that most insults were going to make fun of the subject’s face. However, many insults refer to their non-facial appearance, or clothing, or objects in the background. Since we only do face matching, these comments will make no sense. Other times, comments will refer to the title of the post — in other words, an insult depends on both the submission title and the picture. Again, these make no sense with only the picture. We attempt to mitigate this with heuristics that analyze the comment, in order to exclude roasts which refer to the title or articles of clothing. This approach had limited success because natural language processing is hard. When Andrei initially proposed this idea for an app, I thought the concept was pretty cool and unique. In a month or so we had a prototype, and I spent a few more weeks polishing the project for release. The quality of results you get is still highly variable, but we’re working on improving our algorithms. In any case, it’s my first time with a lot of these technologies, and I had fun and learned a lot building it. I’m about to graduate with a degree in computer science, but I can’t describe how a computer works. Okay, maybe that’s an exaggeration. I can tell you all about assembly language and operating system kernels, and I have a good idea of how to build a CPU out of basic logic gates. That’s where my knowledge ends. I have no idea how to build an AND gate, or how to coerce my 120V power supply to gently power these gates without frying them. Learning is good, and this is a pretty big knowledge gap. 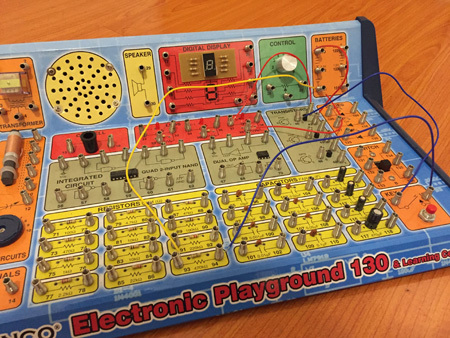 I’m going to teach myself electronics. My plan is to learn by building things. There’s a lot of mathematical theory to learn, much of it is not that useful, and it’s easy to get bogged down in random details. Much better is to just experiment and go back and learn the theory when needed. The first problem was getting components. Unlike computer programming, where everything you need is on the internet, for hardware I’ll actually need to buy things. This is difficult when you don’t know exactly what you need. I also didn’t want a million different parts littering my bedroom haphazardly. Eventually I settled on this all-in-one kit (cost $30). It has a lot of components: LEDs, resistors, capacitors, even antenna and speakers. All the components are fixed to a board, and to connect them together, you use wires that clip to springs protruding from the board. 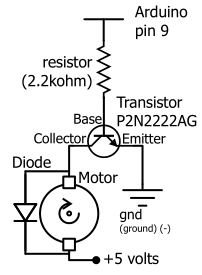 This schematic is a bit too advanced for me at this stage — unfortunately the booklet doesn’t attempt to explain how it works. After playing with this for a while, I learned a lot of basic things like how current / voltage / resistance works, how to read common schematic symbols, and how to decode a resistor. 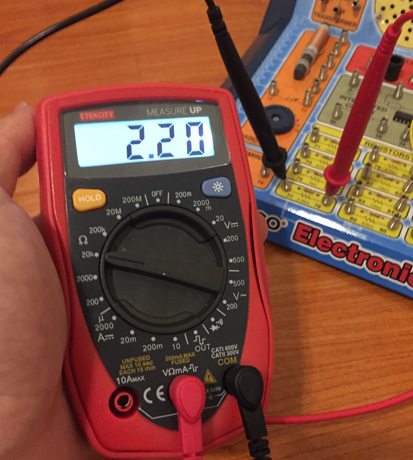 It was easy enough to measure resistance and voltage (both AC and DC). The current measurement was not very sensitive though and I could barely register any reading. I can’t understand how it works right now, but breadboards are pretty neat. Much easier than sticking wires into springs on my electronic kit at home. By now I was reaching the limits of what my electronic kit could offer, and I needed to graduate to something more serious. So I went to the nearest electronics shop and got an Arduino Uno kit (cost $90). The Arduino is a microcontroller and lets you prototype circuits easily with a breadboard. The Arduino Uno is only $25, but my kit comes with an assortment of components and sensors. Before long I had the Arduino up and running. It runs a dialect of C, so I felt at home in the programming environment. I didn’t really know what a transistor did, but it’s what logic gates are made of and the backbone of all computers, so it can’t hurt to learn about them, right? I started off building logic gates from transistors, but couldn’t get it work. It turned out that I misunderstood how a transistor operates (it’s not the most intuitive at first glance). Luckily, I had a friend in electrical engineering and she patiently cleared up my misconceptions. Transistors are used for logic gates, but I didn’t know that transistors can also amplify a current. I also learned about the many different types of transistors. While wiring things up, I accidentally burned a LED and a BJT transistor. Apparently 5 volts without a resistor is fatal to many components. In software, if you mess up, you get a segmentation fault in your console or something — never the smell of burnt plastic in your room. Here’s an idea. Wouldn’t it be nice if your lamp can turn itself on when it gets dark? Useful or not, let’s build it! This is actually a major milestone for me. Up until now, I’ve been mostly following existing schematics, using parts carefully selected by people who wrote the schematics. But for this project, we improvise everything from scratch. Oh yea, also it’s the first time I’m working with 120V alternating current. I’m a bit nervous working with 120V current, obviously it’s a lot more powerful than the 5V of Arduino. Generally, 120V won’t kill or seriously injure you, but it does deliver an unpleasant shock. After stripping the cord, the lamp can be plugged into the breadboard. 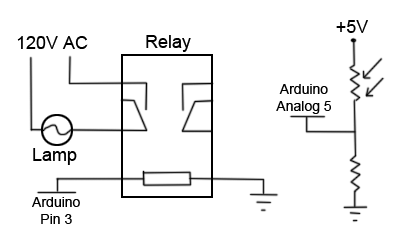 But the voltage is too high for the Arduino to handle directly; instead, I need a relay which acts as a buffer and a switch. 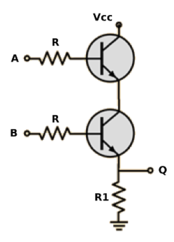 A transistor can act as a switch too, but relays can handle more current. 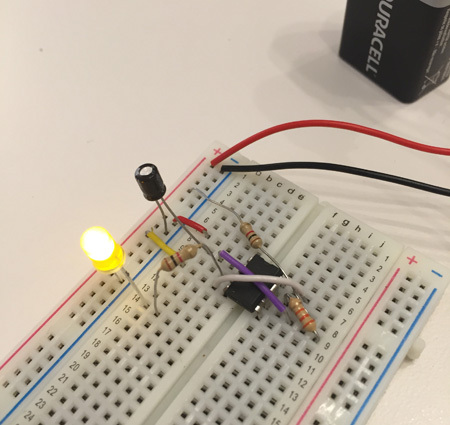 To detect light, I have a separate circuit that uses a photoresistor (changes resistance depending on amount of light shining on it). 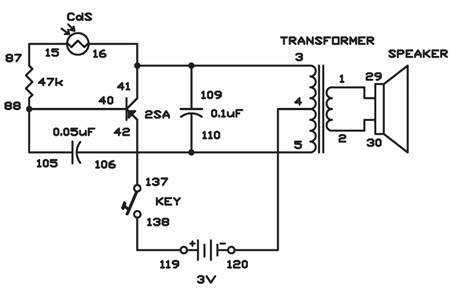 The Arduino can read the photoresistor by measuring analog voltage. Now we do software. It does a loop every 500ms, detects the amount of light, and decides whether the lamp should be on or off. It’s slightly complicated by the fact that when the lamp is on, it produces light and that affects the photoresistor readings. I need to compensate for that but it’s not too bad. Actually my lamp idea probably isn’t that useful. Nevertheless, I made a lot of progress in just a few weeks and I’m proud of myself for that. I’ve barely scratched the surface of all the cool things you can do with electronics, but it’s a good start. Now I have all kinds of ideas on what to build next. I’d better get to it!